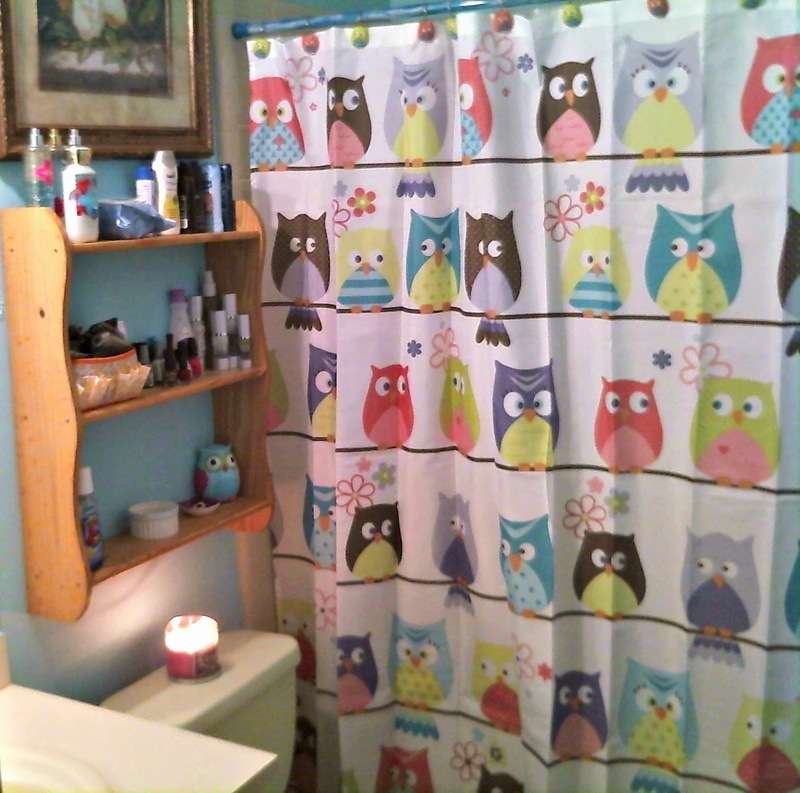 Homemaker Highlights: Frugal Owl Bathroom Makeover! Recently, I repainted and decorated our bathroom on a frugal budget. Many years ago a tree fell through our bathroom ceiling and while we repaired the damage...our wallpaper was ruined. Over the years we tried wallpaper remover, the "claw", steaming it, and many other techniques. We just could not find one that would remove the wallpaper without removing the top layer of our sheet rock. 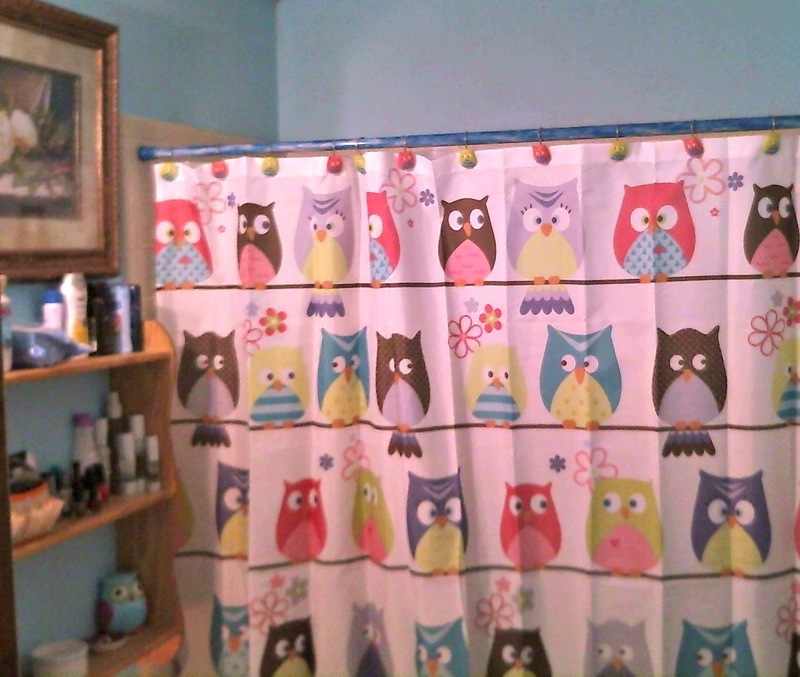 Needless to say our bathroom was an eyesore for quite some time. After a little Youtube researching I found that you can indeed paint over wallpaper and quite nicely. So here's the tour! We were originally stuck between owls or peacocks, but in the end went with owls. 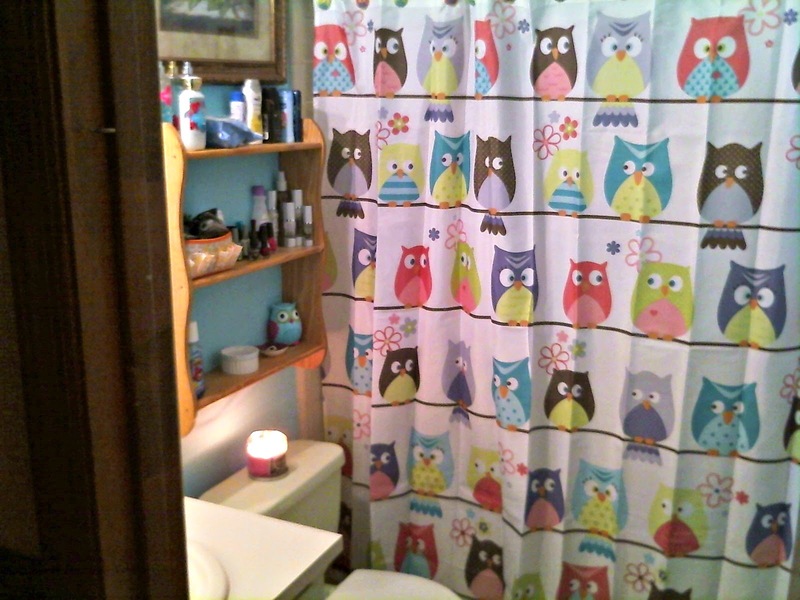 This is the main bathroom in the house and the girls' bathroom, so I figured it's fun and would grow with them. The laundry basket was a giveaway win last year with the Petersboro basket company. The rug is out of a set I already had. 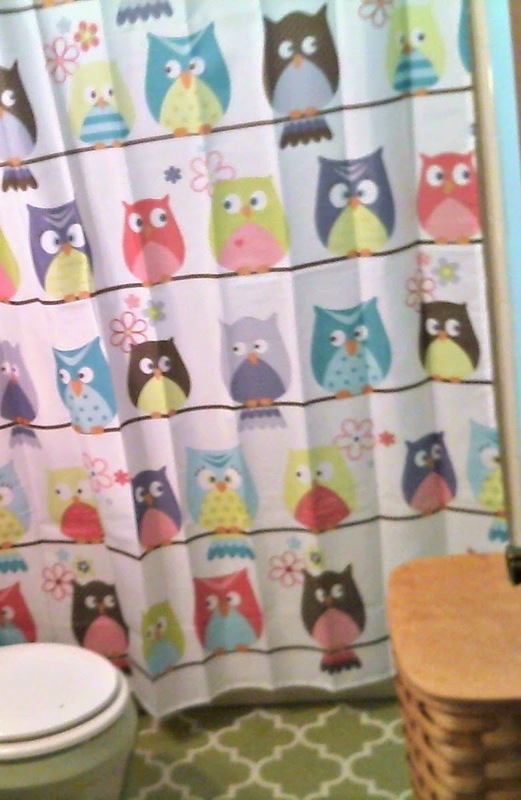 We picked up a shower curtain and owl hooks at Walmart. The shelf was a Christmas gift from Barry's parents many years ago and the wall hanging is an old print I bought from Kirkland's many years ago. The owl accents were sent to the girls by a friend as a gift. The wall color is actually left over trim paint from the girls' room makeover and the trim is left over from a touch up job we did to the outside of our home. Another view point of our tiny and cozy little bathroom. As I have mentioned before...the great part about having small spaces is it takes less time and money to do a total makeover. As you can see the dark color covered up the wallpaper quite nicely and the blue really is sort of a neutral color. I feel like the girls can change from theme to another without any issues in the future. In the end the girls absolutely loved their new bathroom. I think it feels more open and just bright in general. By redecorating it really motivated me to declutter this small space and pick more functional items to stay. 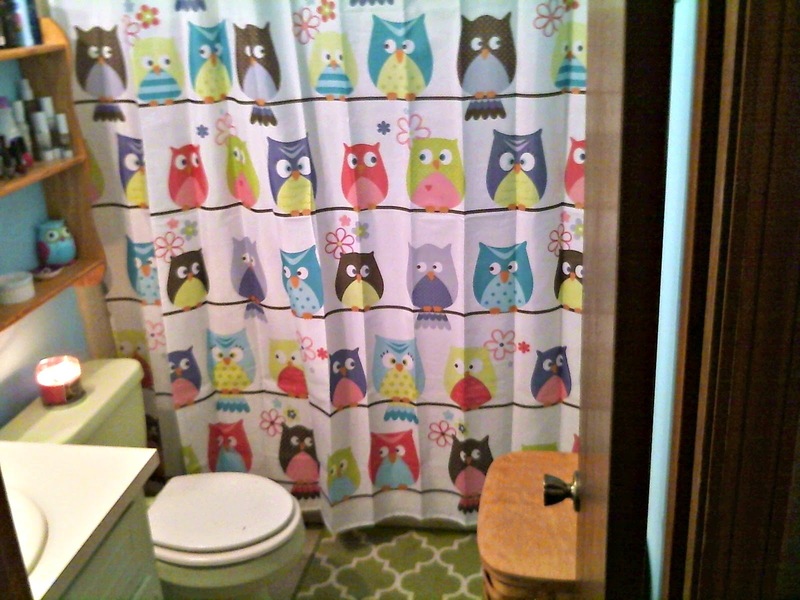 Since the paint was left over from the girls' room, shelf was free, we already had the print, laundry basket won in a giveaway, rug was already in our home, and the owls were a gift. Our only cost was the shower curtain and hooks from Walmart.